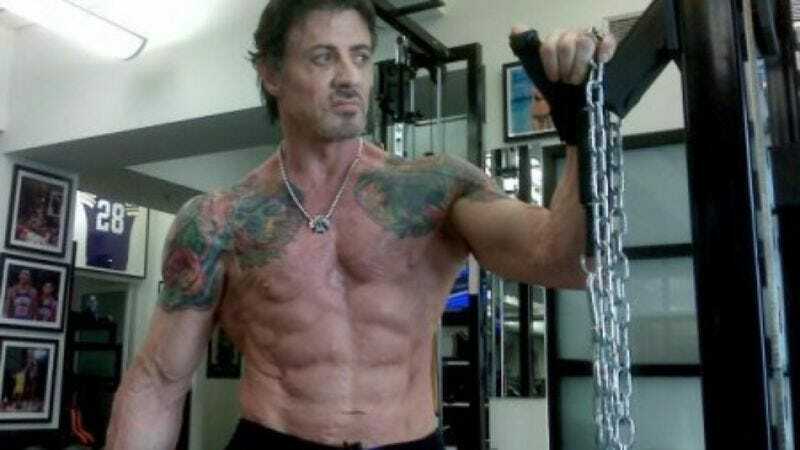 Not content to inspire others to stay physically fit with tweeted aphorisms or refusing to stop taking his shirt off, Sylvester Stallone has signed on to produce a new reality series for NBC. S.T.R.O.N.G. hails from Stallone and The Biggest Loser creator Dave Broome, and like The Biggest Loser, it will follow men and women undergoing a physical transformation while coaches yell at them. However, it differs from The Biggest Loser in that it has Sylvester Stallone’s name on it, and that S.T.R.O.N.G. is an acronym that actually stands for Start To Realize Our Natural Greatness. You may have thought that “strong” was Middle English in origin, derived from the Latin stringere, meaning “to bind tight”—as in Stallone’s neck muscles, or executive producer credits. But you were W.R.O.N.G. (Waylaid Referencing Other Non-Stallone Grammarians). The project will easily be Stallone’s most important acronym-related project since Norman Jewison’s 1978 drama F.I.S.T., and the most inspiring weight loss reality show since whatever the last one was.